Is it time for you to sort out your "kitchen issues"? No matter if it is fair or just, the way it plays out is that you are responsible for ensuring your family is eating nourishing foods. And unfortunately your kids have a pretty bad habit of complaining about the food you make, which is not particularly inspiring! You know you need to turn your ears off and stop hearing their complaints, but at the end of the day you are just so freaking tired! You don't have as much patience. Seriously, why can't they do their complaining at breakfast!? (Although you know the answer to that one...probably because breakfast is filled with sugar... yet one more item on the list of changes in momma's kitchen...sigh). If you could just get some help to feel supported, you know you could turn things around. You're a decent cook. You want to cook healthy. You want your family to eat healthy and live a healthy lifestyle. It is just so hard to get a system into place to make it happen, and you worry you may have waited too long to get my kids eating healthy. Have you ever felt like that? I know I have, and I know many other moms feel that way on a regular basis. The good news is: You really can make the changes that you desire in your kitchen. I'm not gonna lie. It takes work. Although it can also be a ton of fun! And it is always thoroughly rewarding!! You have a number of pint-sized family members (and maybe a full-sized one as well) that are going to dig their heels in and pull out all the dirty tricks they know: Whining probably at the top of the list! And guess what. It's your kitchen, you stock the pantry, you cook the food, and you make the rules. So, the first step is deciding what YOU want your kitchen to be like. What is reasonable, what is healthy, what will make YOU happy? Obviously your family's well-being is a part of the equation of making YOU happy, because the guilt over sugary cereal for breakfast and box mac-n-cheese for dinner isn't helping anyone. Not to mention there are much healthier choices for breakfast and dinner. We can solve your kitchen issues by working together to build a solid foundation of science-based, common sense nutritional know-how. After that we start working through goals and desires. And of course there are weeks when we focus on overcoming setbacks (usually the ones with names like Junior). How to get my kids to eat anything other than carbs.. Yup, heard that one, too. You may be concerned about what kind of milk or milk alternative to be using for your family. (This is actually a pretty charged issue, and people tend to have strong opinions about it, but what about those of us who don't? "Soy milk will turn your boy into a girl." "Cow's milk will make your child hit puberty at 6 years old." "And almond milk is pure sugar!" Another hot topic is getting the kiddos to eat more vegetables. And of course there is the general goal of getting the whole family eating more healthy. We will define what "more healthy" means to YOU and then we can break that goal down into baby steps to take one day at a time. Using a common sense approach, we will shift your family habits to include healthy food and healthy hobbies as well. Making sure your family is getting moving on a regular basis, whether it is biking or walking or dancing or jumping. We will find a way to make health your hobby. We will also work together to help you sort through your own reactions to things like: Picky Eaters! Complainers! And Constant Snackers! To name a few. 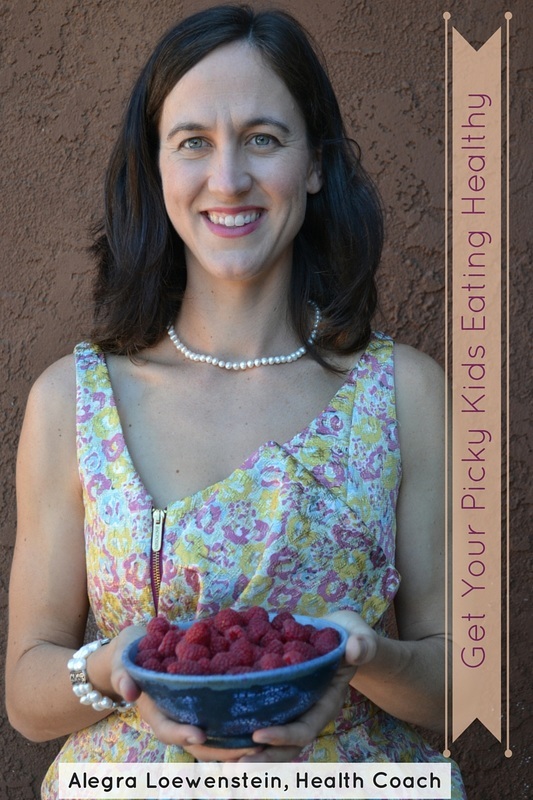 If reading the words "picky eaters" or "complainers" or "constant snackers" makes you cringe, then read on, because this program is definitely for you! With my support, you will forge a path to making confident decisions about meals AND snacks. You will grow to the point of setting firm boundaries about when the kitchen is closed or open, in a way that suits your family's schedule and preferences, without giving in to sugary, salty snacks - except when you want to! 1. What is Good Food? Are you worried about what your family eats? Do you think your kids eat too much sugar? Not enough protein? Are you knowledgeable about food additives but still feel like you can't quite get a plan to "eat clean?" Whatever your concerns, we will discuss your family's health and your goals for the kitchen. There is not a single way of eating that is right for all families. We will use common sense and basic guiding principles to create a solid foundation of nutritional knowledge before venturing into the rest of the modules. 2. What should MY family be eating? Have you ever thought to yourself "I just don't know what to make that my kids will want to eat?" Have you ever made more than one meal for dinner? You can stop being a short order cook. Using the principles in the first module, we will make sure that you know what is best for you and your family. This way you won't worry unnecessarily, and you will be confident in the food choices your family is making. Most of us have some picky eater in our life... if yours is one of the people eating, and not one of the people cooking, that can be a very frustrating experience. Let's work through some of that to get to a place where everyone can enjoy more healthy family harmony at the dinner table. Have you found the perfect meal planning system yet? There may be no one perfect system, but there are a lot out there to try out. I'm sure we can find one that will help you streamline your efforts, so you have more time, more energy, and more healthy meals as a family. Bonus: Sticking to the plan! The program is designed to be flexible. This final "bonus module" may come at the end, or may jump ahead in sequence. It is all about what YOU need to achieve your health goals for your family. When obstacles arise, I will support you as you figure them out and work through them. ​When you have questions or concerns, we will address them. We can work together to develop a meal plan. I can teach you how to analyze a recipe. I can research certain foods or topics. Together we can brainstorm solutions. There are so many ways to explore and so much progress you will experience in you and your family's health during this program. Bonus #1. Free Pantry Makeover to start your Health Coaching off right. For those who have previously purchased a Pantry Makeover, you can choose between another Pantry Makeover or an additional coaching session (to make 11 weeks of coaching). Valued at $199. Bonus #2. One free follow up session to be used within three months of the last regularly scheduled coaching session, valued at $99. This is the perfect way to keep your awesome momentum going after our weekly sessions have ended. If more questions come up or if you just want another round of planning and encouragement, this session is the way to keep your Healthy Family Harmony going! Bonus #3. Every week you will receive a Personalized Progress Report that includes achievements and goals. 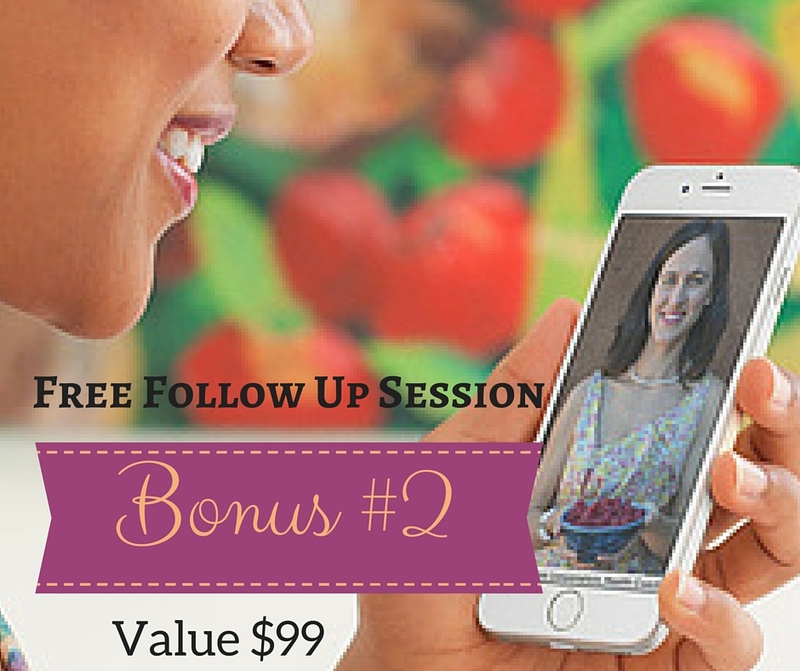 I will also send you any relevant Tip Lists or Recipes that came up during our session. I am available to research questions and offer reviews of products or services that may be of help to you on your journey. Basically, I am going to make sure you have every resource you need to get to where you want to be, provided to you in the way that serves you best! Valued at $49 each, you can easily receive up to $99 of additional material each week (or more! ), for a value of $990 or more! Bonus #4. Access to my mini video workshops to review at your leisure. Valued at $14 each. That is a total bonus package worth $1288 or more! ​Of course unlimited emails are also included during the ten-week coaching program as well, for questions and feedback that come up on the days we aren't scheduled to speak. The magic spreads throughout your family, leaving everyone with a better attitude when it comes to the kitchen table. You will look forward to dinner, you will enjoy time with your kids, they will stop complaining, and believe it or not, they will start eating healthy! ​And I've helped other moms do it, too!